Happy Halloween from Turning Veganese! 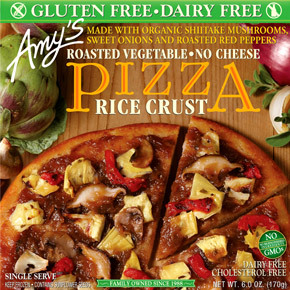 Um, now here’s the part where I apologize because this isn’t really a Halloween-themed post, but a Lazy Vegan review of Amy’s Rice Crust Roasted Vegetable Pizza. I liked Amy’s products a lot in my pre-vegan days. Their stuff is just better than other frozen prepared foods in many ways. 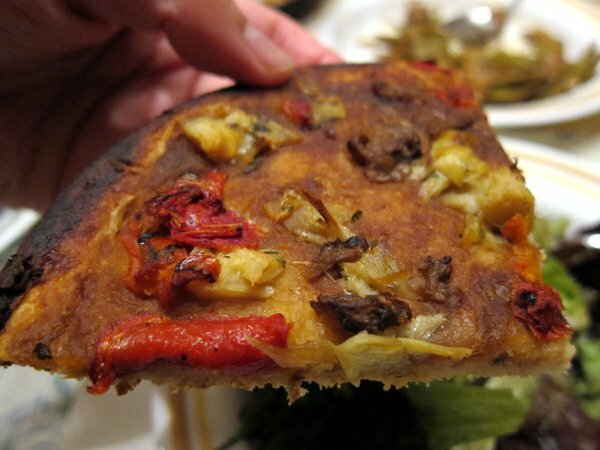 This pizza is single serve and topped with shiitake mushrooms, sweet onions, and roasted red peppers. It has no cheese (dairy or otherwise) and is gluten-free. It’s easy to cook in the oven, but what I really loved is that they provided toaster oven directions as well. I love using my toaster oven!! Bonus: no cheese means no potential mess in your oven or oven rack. Sadly, it is not soy-free. It’s not a thousand calories and was the perfect portion for a dinner, though I did make a salad to accompany it. At the first bite, I was kind of weirded out by the rice crust. I got over it quickly, though. The crust had a nice crunchy texture. The sauce was good and not slimey like on other frozen pizzas. The veggies were good; the sweet onion was the real star among them. I have to admit that the pizza was kind of bland. I sprinkled some garlic salt and red pepper flakes on it and topped with some fresh cilantro that I had in the fridge. It made a HUGE difference! 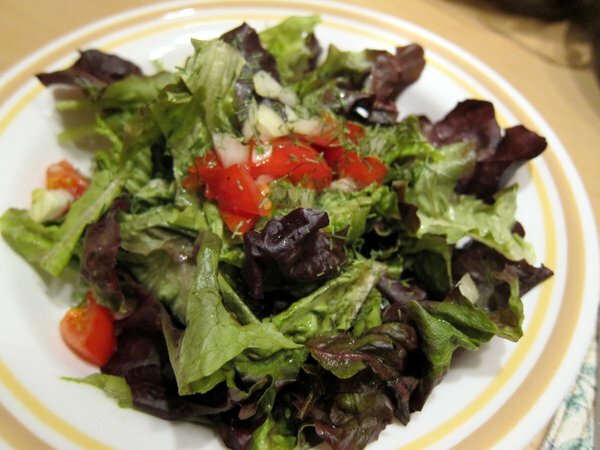 Here’s a photo of the salad I made. Doesn’t it look delicious? It was! So, yeah… mine doesn’t exactly look like the version on the box. It might look a little burnt on the edge, but there was no burnt taste and it was just as edible as the rest of the slice. I am likely to buy this again, but I might watch to see when it’s on sale or I have a coupon. Amy’s has a lot of great products, but, unfortunately, you won’t find their vegan products in many (or any) stores outside of your neighborhood Whole Foods. It is surprisingly possibly to enjoy a vegan* meal at Portillo’s without having to resort to a salad. Portillo’s is an awesome spot when you’re in the mood to pig out on hot dogs, burgers, Italian beef, Italian sausage, chili… goodness, I just had gross meat flashbacks. For dinner tonight, it was either eat something from Portillo’s or eat a rotting tomato. (Okay, it wasn’t that dramatic, but still.) 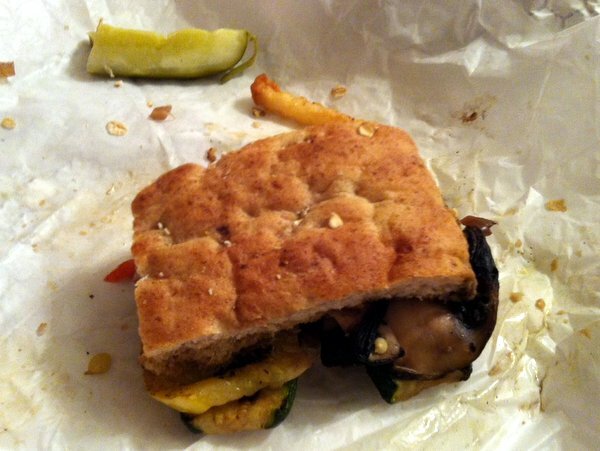 So I tried the Grilled Vegetable Sandwich for the first time ever. Please pardon the poor photo: I ate half the sandwich before I remembered to take a pic! The grilled veggies in the sandwich include yellow squash, zucchini, portobello mushrooms, red peppers, and red onion, along with fresh tomato. It all comes on a multi-grain focaccia and served with a pickle. I asked them to hold the cheese. This sandwich was very satisfying! I could barely finish it. I will definitely order it with hot peppers next time. Some fresh basil added to the mix would do wonders for it as well. The veggies and the bread were fresh. It’s definitely a great vegan or vegetarian option. *Yeah, the bread probably isn’t vegan. And I had some fries which probably weren’t totally vegan. Hey, don’t forget about our giveaway! Read this post for all the details and thanks for visiting Turning Veganese. You are awesome!